It’s almost here. 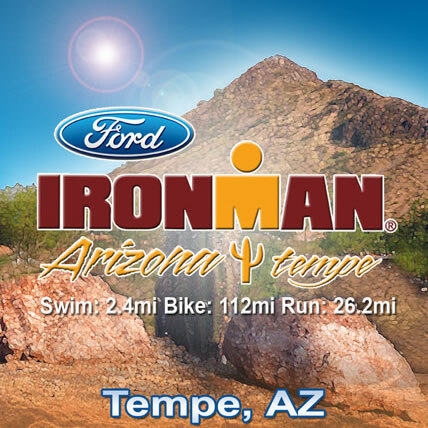 Ironman Arizona. After all the hundreds of consumed GU’s and Gatorades, waking up feeling like a bull-dozer hit you every morning for 4-12 months, and having your drive, courage and heart tested day in and day out, it’s time to see what it was all worth. Let me start by saying Arizona Ironman 2011 was my first, and I know what everyone has gone through with training. I’ve had the days when I’ve collapsed in tears on runs wondering how I was going to piece it all together come ray day, absolutely terrified of failing. It probably didn’t help I was only 22 years old and felt a little bit over my head. However, the fear is what fueled my training, and ignited my hunger to eat this race alive. With all of this said, there’s a few tips I could have used, and want to share some golden advice so you too can have the race of your life. I’d also like to note that this is what worked for me, and by no means should anyone think these tips are the only way to go. The shortest leg of the race in triathlon is often funny enough, the most feared. By far, you’re certainly the least out-of-control of your surrounding environment in this leg, which can allow for the capability to put a nice damper on your time. Most triathlons take place in some kind of a body of open water, so assuming your pool skills will transfer right over isn’t the case, and often times, can be dangerous. There’s many tips that can be followed to keep yourself safe, and drop seconds to minutes on your swim. We spend tons of money on gadgets, wheels, aero-dynamic and light-weight everything to save seconds and minutes, so why not take the time to practice open-water techniques for the swim? The question of, “What am I supposed to be wearing underneath my tri wetsuit?” is undoubtedly the most asked in the shop. The idea of wearing clothing underneath neoprene, seems odd to many first-time triathletes. In reality, you can’t tell a difference underneath your wetsuit, and will save quite a bit of time by swimming in what you will be racing in. Essentially you wear whatever it is you’ll be competing in underneath. Often times, it’s the same clothing that you’ve been training ever so hard in over the course of the past months/weeks. With that said, triathletes have a couple of options as to what they choose to wear underneath their tri wetsuit. Say hello to the 2XU Elite Compression Tights. This tight is not simply your average compression, but a part of a newly designed line by 2XU called PXR (Perform, XFORM, Refresh). In particular, the XFORM garments give you the benefit of two in one compression. It is designed as an Active + Recovery tight. This means that the grade of compression and construction of the tight is designed to be used while training, as well as as post-workout recovery. How is this possible? Oh swimming. With 85% of triathletes coming from a running, cycling, or other background, it’s no wonder so many people fear this leg of the race the most. If swimming isn’t your strength, blue seventy has an answer. The Axis. Blue Seventy has recognized the fact that there’s different needs for different types of swimmers. Some athletes have denser leg compositions due to established thigh muscles and dense calves. Many of these swimmers tend to drop their lower half in the water. Thus, the Axis was innovated with balanced buoyancy zones. This suit in particular focuses higher buoyancy in the hips, thighs and lower legs. I present to you the Louis Garneau Tri Pack Revo. What’s so different about this tri bag you ask? Firstly, it dons a chair! Yes, a chair. A fold up seat to rest those tired legs in transition. Perfect for when the race is over and and you don’t feel like bending down to take those running kicks off. Beyond the chair, there’s a plethora of pockets and zippers. One main as pictured below, which is sectioned off into additional pockets, and then another main. If you’re thinking this many pockets on a tri bag is overkill, then try to use a standard backpack for a race and see how hard it is to keep track of the insane amount of items we trek around to and from training and races. Everything seems to have a place in the Revo. With that said, and your money pockets taken into consideration, feast your eyes on the Category 3. TYR’s Hurricane wetsuit series is composed of three tiers (pun intended), 1, 3, and 5. For those that want the primary technologies of the Category 5, but don’t want to spend top dollar, the C3 is the perfect option for a mid range suit. The wetsuit boasts light-weight Yamamoto 38/39 SCS coated neoprene, as well as varying 5mm panels. The high-buoyancy 5mm panels found in the chest, legs, and core were designed to help the swimmer to be elevated in the water and keep the swimmer from dropping their lower half. I’ve been in the triathlon world over the course of the past 7 years and have certainly gained a wealth of knowledge about the sport amongst most domains. Producing multiple races myself, competing in my first Ironman at age 23, and now working within the product realm at OneTri.com, I can with confidence say, my words within this blog come with backing. Hopefully my reviews and personal testimonies will aid in helping readers get all they want and more out of this sport.